In my last post I said I finished two quilt tops this weekend, which means I have another one to show you. It’s the product of twelve pairs of hands from the Quilts for Cancer bee, each making and sending me one block for the quilt. Our bee is called “Quilts for Cancer,” but we’ve been realizing throughout the months that these quilts are really for anyone in need of some comfort in their illness. Mine will be for a client of the law firm I work for. I wish I could tell you more about her because her story would amaze and inspire you. I hope this quilt will not only provide her and her wonderful family with a little happiness, but also show them how much they’ve inspired everyone at our firm with their courage and love. 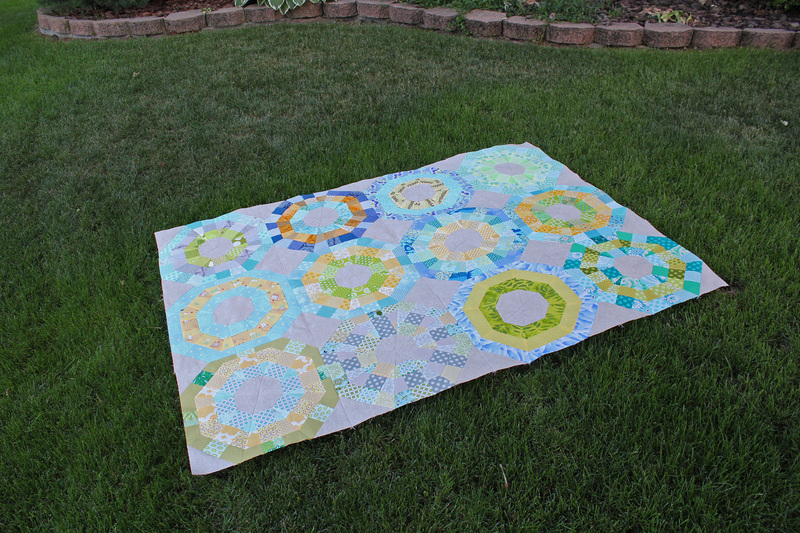 As for the quilt design, I posted about Elizabeth Hartman’s Octagonal Orb block in a previous post if you’re wondering where you can find this fantastic block pattern to make yourself. 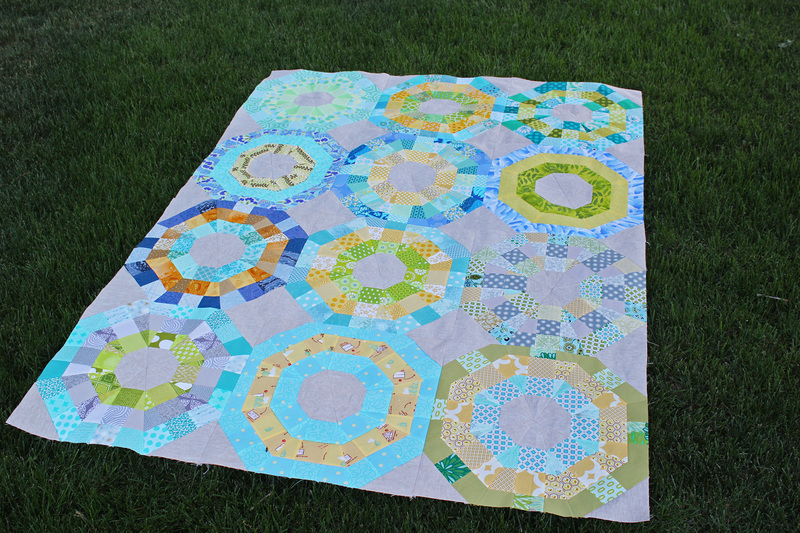 I decided not to sash the blocks because they’re already large and I didn’t want the quilt to be so big. Instead I trimmed all the blocks a little to bring them to the same size and just assembled them side-by-side, which I think turned out looking pretty cool. This pattern would be great with a more contrasting background fabric to really make the orbs come forward and the diamonds at each intersection pop. I do still love my linen choice for the background fabric in this quilt (yarn-dyed Essex cotton/linen blend in Flax) and have lately come to the realization that it’s my favorite fabric. I’ve been incorporating it into almost everything I sew and don’t plan on slowing down soon. I think the texture is what grabs me –it’s delicious. I haven’t fully finished a quilt since my Backyard Boy so I’m stoked to finally get my quilt on! For this one I think I’ll echo the octagon shape in my quilting design. I’m also really looking forward to doing some hand-stitched bindings. Taryn at from Pixels to Patchwork recently had this to say: I *love* hand sewing the binding. It allows me to be lazy and productive at the same time! I totally agree! You KNOW I’ll be watching me some Downton Abbey while I bind these. That or Harry Potter. Anything British, really. Beautiful quilt and beautiful story! Enjoy Dowton Abbey -I'm anxiously awaiting season 3! Oh my this is beautiful!!! I love the color palette with the linen, it's very soothing which sounds perfect for the recipient. It is so very beautiful! Lovely work my dearest!